This is my 3rd look at some of the wee Friends range of 1/35 scale Royal Navy sailors. This in fact was the first RN figure in the original Jakeri range and his morph into resin has not taken anything away form the figure in fact I would say has added to it. Cast in a light cream resin, the figure comes in 2 parts, the body being cast as a whole is dressed in shoes, trousers, a typical RN jumper covered with a Duffel coat.. You get a head wearing a sailors cap. The arms are cast onto the body and hands are thrust into the duffle coat pockets. The casting on the body is excellent, nice folds in the duffel with the button detail present on the front and cuffs and a good representation of the coat hood. His trousers are of the bell bottom sailors type and look to hang appropriately over his work shoes. Only the polo neck of the jumper is shown but this too is well depicted. This should paint up into a very good figure indeed. The head is quite well detailed, and sports a sailors cap perched back on the top of the head. The resin is quite shinny and this tends to hide the detail on first look but with an undercoat this should paint up into a perfectly acceptable head. The pose of the figure is quite natural showing a sailor hands in pockets looking forward and slightly to the right. The left leg is straight whilst the right is angled forward in a natural way causing a nice natural relaxed look. All the parts were well cast and I could only find one tiny air bubble on the front bottom of the duffle coat flap. Only a minimal amount of clean up will be required to remove the pour block on the sole of the boots and there was a very faint seem line on the left leg and boot that would need dealt with. I like this figure and it would be very flexible in use given the stance. Quite suitable for on ship or shore, observing what’s going on or in interaction with other figures, both modellers and diorama builds should be able to find a good home for this one. 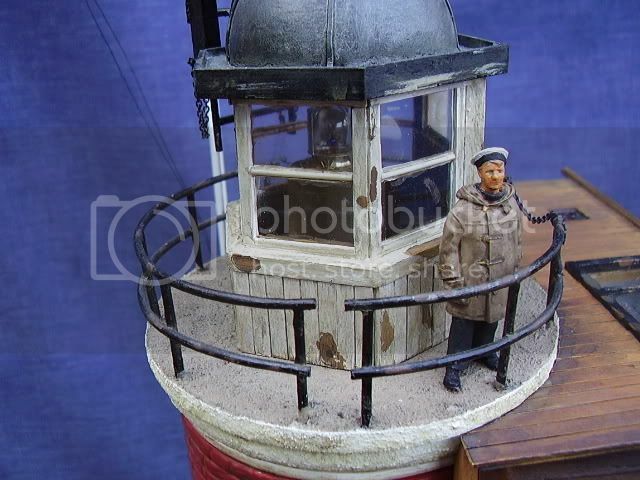 This figure will add interest to any scene on land or sea, the pose is natural and I like very much the order of dress with duffel coat and sailors cap. Those with a bit of imagination might also see the makings of an SAS type here. I built the figure when I was proof reading this review. Make sure you use a CA glue that allows a few minutes drying time in order to allow you to line up the head. In the finished example I used an alternative head as it fits better with my project. I would like to see some Officers and Pretty Officers heads available to add greater variety to the figure. Highs: A really unusual figure, adaptable to land or sea, with a good order of dress. Well cast with good general detail, used alone or in a diorama this figure should add a lot of interest. Lows: A tiny imperfection in the cast, that should be an easy fix.